Application Note CHEM002:Instructions for use for the human CXCL12/SDF-1 ELISA Kit. SDF-1α (CXCL12) is a CXC chemokine . The small basic protein (ca. 8 kDa) has no glycosylation site in its sequence . The homology properties of SDF-1α are unique among the chemokines. It has a high degree of conservation within the mammalians, with 99 % identity between the human and the murine SDF-1α sequences. But it shows a weak homology to the other CXC chemokines and the SDF-1 gene is on chromosome 10, whereas the other chemokine genes are on chromosome 4 and 17 . Except for SDF-1α there is another isoform of this chemokine, SDF-1β. SDF-1α and SDF-1β result from alternative splicing . SDF-1α binds to and activates the receptors CXCR4 and CXCR7 , whereupon SDF-1α is the only known ligand for CXCR4 . SDF-1α binds also to fibronectin-1 , several glycosaminoglycans and heparin . SDF-1α is constitutively expressed by bone marrow stromal cells  and many other tissues (for example heart, liver, brain, muscle, kidney) . The function of SDF-1α is multifaceted. It plays a role in the prenatal development of the neural, hematopoietic and cardiovascular systems and is involved in the postnatal migration of CXCR4- and CXCR7-positive stem cells . Furthermore, it has a chemoattractant effect on CXCR4-positive lymphocytes  and plays a role in the growth and the metastasis of CXCR4- and CXCR7-positive tumors . Except for the chemoattractant effects SDF-1α has an inhibiting effect on HIV-1 in vitro . The biotinylated antibody binds to the streptavidin coated microtiterplate. The SDF-1 α of the standards/samples binds to this antibody and is detected by the primary antibody. The biotinylated antibody, the primary antibody and the standards/samples are incubated on the microtiterplate altogether at the same time. The primary antibody, which is bound to SDF-1α, is then detected by a secondary peroxidase-conjugated antibody. The reaction with the substrate is stopped by addition of acid and the blue colour turns to yellow. The measured absorbance is directly proportional to the quantity of SDF-1α. 1. Microtiter Plate: 96 wells (12 x 8 well strips in a foil pouch with desiccant), coated with streptavidin. 2. Biotinylated Antibody: antibody to human SDF-1α, 6 µg, lyophilized, reconstitute in 60 µl Assaybuffer, dilute 1:100. 4. Standard, human SDF-1 alpha, 1 µg, lyophilized. 6. Assaybuffer: 40 ml, ready for use. 7. Washing buffer: 20 ml, 10-fold concentrate. 8. Substrate: TMB, 12.5 ml, ready for use. 9. Stop solution: 0,2 M sulfuric acid, 12.5 ml, ready for use (Caution: caustic). The ibt SDF-1 alpha-ELISA is for in-vitro research use only! The assay buffer contains bovine serum albumin. Therefore it should be treated as infectious materials and precautions should be taken as e.g. adequate clothing, wearing gloves etc. All waste should be disposed following the regulations for infective materials. The stop solution contains acid that is harmful. Avoid contact with skin, eyes and mucous membranes. 6.1.1 Bring all reagents and the microtiter plate to room temperature. 6.1.2 Reconstitute the standard with 250 µl of the Assay Buffer . 6.1.3. Reconstitute the biotinylated antibody with 60 µl Assaybuffer (stock solution). Mix carefully and keep at room temperature for at least 30 minutes to ensure complete dissolution. The dissolved antibody is stable for one month at 4 °C. Spin down the contents of the vials with the reconstituted Capture Antibody and the Detection Antibody solution by centrifugation and transfers contents into a vial with 6 ml Assaybuffer. Use the same day. For a half plate: Mix 3 ml of assaybuffer with 30 µl Capture antibody and 180 µl Detection antibody solution. 6.1.6 Prepare the required amount of washing buffer by dilution of 1 volume of the concentrated washing buffer with 9 volumes of distilled or demineralized water. Use within one week. The kit should be stored at 2-8°C. Dispense 50 µl of the assay buffer into the other wells of the microtiter plate. Dispense 50 µl of the standards and samples in duplicates per well. Incubate for one hour or overnight at room temperature (22-25 °C). Note: a constant temperature is important for a low coefficient of variation. Avoid draughts. Incubation is best done in a closed incubator with constant temperature. Automatic plate wash: Set plate washer to dispense 250 µl of washing buffer per well and a minimum of 20 seconds per washing step. Fill and aspirate for 3 cycles. Manual wash: Decant the contents of the wells by inverting sharply. Dispense 250 µl of diluted wash buffer to all wells. Decant and repeat twice. When washing is done manually, tap the inverted plate firmly on absorbent tissue to ensure complete removal of washing buffer before proceeding to the next step. Dispense 100 µl conjugate working solution per well and incubate for one hour at room temperature. Dispense 100 µl substrate solution per well. To minimize imprecision, this should be done by a multichannel pipette or in timed intervals. Incubate for 30 minutes at room temperature. Stop reaction by adding 100 µl of stop solution to each well. To minimize imprecision, this should be done by a multichannel pipette or in timed intervals as in step 6.3.5. The blue colour will turn yellow upon addition of the stop solution. Measure the absorbance of each well at 450 nm (reference 650 nm). The results are calculated by linear regression. 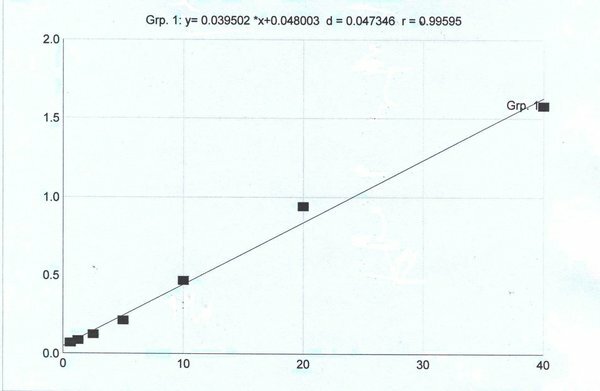 The standard curve is plotted by drawing the regression curve with the absorbance on the y-axis and the concentration on x-axis. Calculate the results of the samples and multiply by the dilution factor. 10 serum plasma pairs (EDTA-plasma) have been tested. The correlation between the absorbance values of plasma and serum was 0.9957. No interference has been observed in spiked samples with up to 1mg/ml bilirubin, 5 mg hemoglobin and 4 mg/ml triglycerides. Anyway, we do not recommend to use highly lipemic or grossly hemolyzed samples. The intra-assay precision was determined by testing plasma samples 9 times on one plate. The CV was 0.80 % (sample 1) and 2.24 % (sample 2). The intra-assay precision was determined by testing plasma samples (4-fold determinations) on five days. The Inter-assay precision was 8.37 %. The minimum detectable dose was determined by adding two standard deviations to the mean optical density value of the zero-standard and calculating the corresponding concentration. The minimum detectable dose was 0.31 ng/ml. Maréchal V (1999) "Opposite Effects of SDF-1 on Human Immunodeficiency Virus Type 1 Replication." Journal of Virology 73 (5): 3608-3615.